The stone tile pattern (石畳模様 ishidatami moyou) is named after the flat, square stones used to make paved roads or tile flooring. The tile shape naturally lends itself to creating decorative patterns across wide, flat surfaces, especially textiles. The checkered pattern is among the oldest decorative designs used in Japanese handicrafts. There are samples of checker-patterned fabric in the “Imperial Collection of Stone Tile Patterns, Miscellaneous Colors, and Weaving Techniques” stored in the Shousouin Imperial Treasure Repository in Nara. Some of the textile examples, including the hanada kokechi no nuno no hou (pictured), date back to the Nara Period (710-794 CE). This jacket was worn by Imperial court officials. The fabric is covered with a small checkered pattern created by shibori tie-dyeing. The lighter stripes were originally dyed red, which has faded. 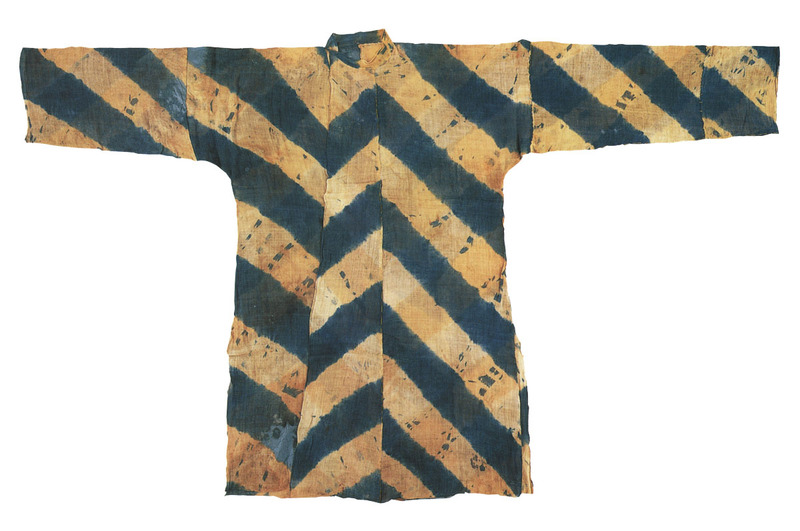 During the Heian period, Imperial court officials wore checkered patterns to designate their court rank. 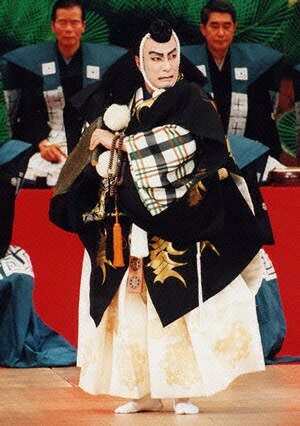 For example, checkered hakama skirts could be worn by officials of the third rank and higher. In addition to coloring woven fabric using dyes, checkered patterns can be created by weaving together colored threads. There are a variety of names that refer to checkered designs. Ishi datami (stone tile) is a general term that refers to checks or plaids in a variety sizes and colors. Arare (hailstone) consists of small, square checks of just one or two colors. Koushi (lattice) refers to plaids in a variety of sizes and colors. During the Edo period, Kabuki actor Sanogawa Ichimatsu wore a checker-patterned obi sash onstage, and soon the pattern became fashionable in clothing worn by the general public. The checkered design was called the ichimatsu moyou (ichimatsu pattern) and this name is still used today to describe checker-patterned items. Kabuki actors frequently sparked popular fashion trends in clothing. Uemura Kichiya, an Edo actor who specialized in oyama/onnagata (female roles), popularized a style of wide-brimmed hat, kichiya gasa, and obi knot, kichiya musubi. The purple kerchief-like cap, mizuki boshi, worn by Osaka oyama Mizuki Tatsunosuke caught on with fashion-conscious women in Kyoto and Tokyo after he performed in both cities. Other checkered designs inspired by Edo period theatre actors or characters are danshichi jima (danshichi plaid) and benkei koushi (benkei plaid). As with ichimatsu, these patterns are still in use today. 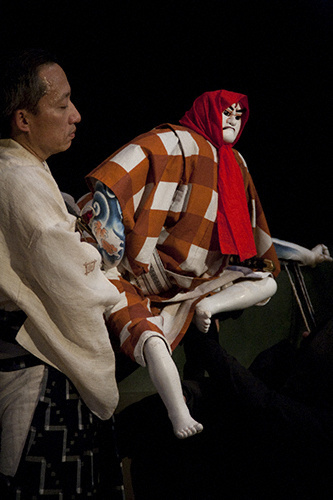 Danshichi, from the bunraku/jouryuri puppet theatre. Danshichi is named after a villain who appears in a bunraku/jouryuri puppet play called “Chronicle of the Summer Festival in Osaka.” The character wears a kimono decorated with a bold plaid of dark orange and cream. Benkei, from the kabuki theatre. Benkeigoushi (Benkei plaid) is likewise inspired by a character from a play. Benkei is the protagonist hero of the Kabuki play “The Subscription List.” The color of his plaid kimono varies depending on which actor is playing the role. The categories of stone tile crests include a variety of configurations with the most common being groupings of three, four, eight and nine stones. Family crests using the stone tile pattern are described in very old Japanese historical records. One of the first mentions occurs in the “Eastern Mirror” (Azuma Kagami), which is a historical text describing events happening within the Kamakura Shogunate from 1180-1266. Descriptions of “banners bearing stone tile crests” appear in records of the first year of the Houji era, which encompassed the rule of Emperor Go Fukakusa (1247-1249 CE). According to the “Hanetsugihara Battle Chronicle,” a stone tile crest was used by the Gochou faction of the Inukai clan of Hirase Island. This battle was fought between the Uesugi and Ashikaga clans in 1459. Many families associated with the Fujiwara clan use stone-tile crests, including Udono, Masaki, Akita, Imamura, Kumagura, Saitou, Irie, Iguchi, Kamiya and Uehara. Other families that use stone tile crests include Arata, Yamamoto, Inukai, Tamiyoshi, Yoshimatsu, Maki and others. The Tsuchiya clan uses the three-stone crest. There are a number of families associated with the Tsuchiya clan that also use the three-stone crest. According to the “Genealogical Register of Edo Bakufu Vassals” the following families are associated with the Tsuchiya clan and may use the three stone crest: Yoshiie (of Seiwa Genji), Yoshimitsu (of Seiwa Genji), Ashikaga, Ogasawara and Yoshifumi (of Taira).